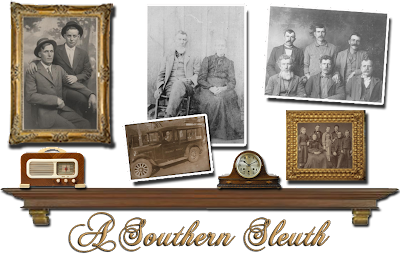 A Southern Sleuth: Family History for Kids isn't Rocket Science! "Whose did these belong to? With the crazy world that we live in, it is so easy to worry these days and my grandkids are at the top of my worry list. Not only do we live in challenging times, but several of my grandkids are dealing with some difficult issues. How can I help them? There has been a lot written and shared over the past few years about the benefits of involving children in family history and the many ways it helps them, especially when times are tough. In a series in the Deseret News newspaper, Linda and Richard Eyre shared not only reasons why we should involve children in genealogy, but relatively simple ways to do it, including creating a story book of ancestor stories. You can find their article here: "Top parenting ideas, No. 2--The 'Ancestor Stories Book'." In the Eyres' article, they reference a well-known article published in The New York Times back in 2013, "The Stories That Bind Us", in which the author shared the strength and "grit" that seems to be more apparent in those children who know their ancestors' stories. Determined to find ways to incorporate family history into the time spent with my grandchildren, I've found some relatively simple ideas that are fun! Although one grandson is very interested in helping with the research end of genealogy, the others seem to do better with a more sutble approach. Much of what I have done with my grandkids is not totally new or original, but are just simple things that they enjoy. I like to have photos and memorabilia that have been passed down mixed in with other decor on my shelves and tables in my home (see photo above, right.) Children are naturally curious and they tend to ask questions, like "Where did you get that?" "Whose was it?" "Am I related to them?" I try to keep my answers and stories relatively short and simple so that they don't regret asking, but I am willing to say more depending on their interest level. 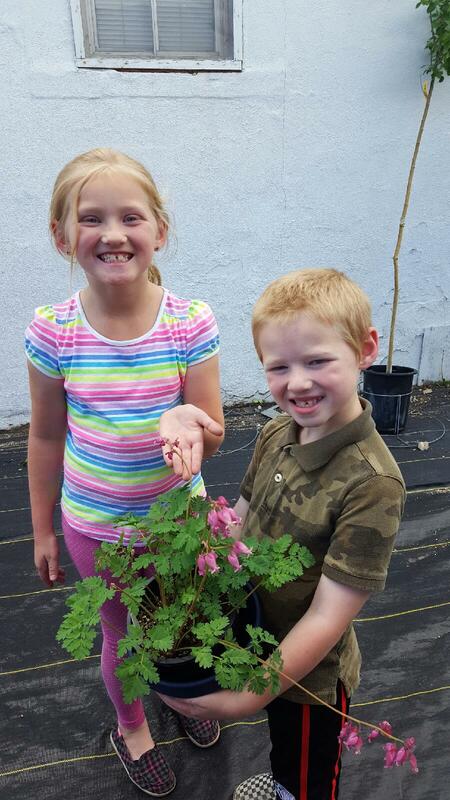 As I was planting this past spring, I was sure to include things that my grandparents had grown and I took grandkids with me to pick the plants out.The kids loved hearing stories about my grandparents and how they had some of the same plants in their yards and gardens. One item high on my must-have list was a bleeding heart plant because my grandmother always had a bleeding heart in her garden. As a child, the name intrigued me. I loved the delicate heart that dangled from the plant As we looked at the different colors of bleeding heart and tried to decide which one to get, I told them a few short stories about my grandmother. They decided they needed to have one as well and I was told they shared some of the stories I had told them with others. Mission accomplished! We regularly have our children and their families over for Sunday dinner and periodically we like to do "Guess who is coming for dinner?" A dear friend shared this idea with me and my family has really enjoyed it. We simply set an extra place setting at the table for an ancestor, as if they were going to come to dinner. We cut out of butcher paper a life-sized outline of a person which we use each time. For the face we can scan a photo, blow the photo up, print it and then tape it onto the butcher paper. The first month I did it, my ancestor's picture was so poor and distorted when I tried to enlarge it so I just set a picture of her on the dinner plate. 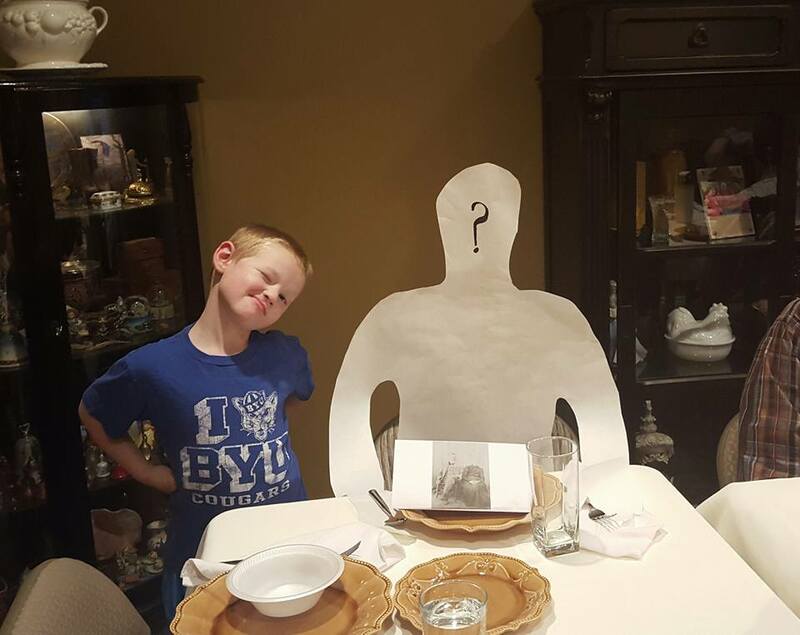 I have the cutout sitting on a chair at a place setting when everyone comes for dinner. I try to make it as mysterious as possible, allowing the grandkids to ask questions about who it is and giving them interesting little teasing tidbits about the ancestors as we eat. The adults may chatter about other things, but I have noticed the grandkids are so intrigued with who the ancestor is, they keep bringing the conversation back to who is visiting and give us one more clue! After dinner we gathered in the living room and I told them all about the ancestor. Recently I took some of my grandkids on a cemetery scavenger hunt. Just google "cemetery scavenger hunt" and you will find many ideas for things to look for in a cemetery, or you can come up with your own list. The list I used had things on it like find the oldest headstone, find the most interesting first name, find a headstone that shows or mentions someone's occupation---you get the idea. The kids loved it. I didn't grow up here, so none of my ancestors were actually buried in the local cemetery, but as the grandkids looked for various things on the list, it prompted questions about their own ancestors. After two hours, yes, you read that right, TWO HOURS, and as it began to sprinkle, we decided to head home. Of course treats afterwards are always a good option with kids and allows time to talk about what we've seen and done. I admit, several years ago when I first heard people talk about involving children in family history, I was skeptical. I thought of my own carefree childhood days spent riding bikes, playing games and playing outside and I couldn't imagine myself choosing to do genealogy over any one of those things. My grandkids love to do those things too, but we have found simple ways to work family history into their lives as well and it has paid off. There are so many fun ways to interest kids in family history and there are so many good reasons to do it. Family history helps anchor kids, gives them a sense of who they are and helps them to see that although life presents many challenges, they can succeed just as their ancestors did. Michelle, your ideas so wonderfully imaginative. I love the "mystery guest" idea. And seeing the smiles on your grandkids' faces, it's clear they're enjoying the ancestor hunt. Merry Christmas to you and your younger sleuths! What a great post Michelle. I love all your ideas, especially the guest at dinner. I wish our grandchildren visited more than every few years. We go to their home, but they rarely come to ours due to their busy sports schedule. Thanks for sharing your ideas with us. You have done an incredible job teaching my kids to love family history! We had to get our own bleeding heart because they enjoyed not only the time they were able to spend with you, but the extra meaning it had! Love this post Michelle! Such great ideas! Mystery guest -- what fun. Has Cloudy Night Rainwater been featured yet? Michelle, these are great ideas! Our grandson is only a year old but I look forward to sharing the family history with him. What wonderful ideas, Michelle! It definitely sounds like you are making family history fun and leading them to want to learn more. Wonderful!